Have you ever seen anything like this? 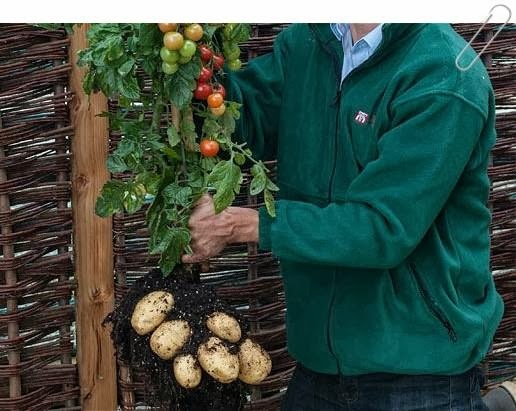 A plant which is half a tomato plant and half a potato one! The TomTato can grow more than 500 sweet cherry tomatoes while producing white potatoes. The plants can be grown either outside or inside, as long as they are in a large pot or bag. The hybrid plants were individually hand-crafted and not a product of genetic engineering. *sweet cherry tomatoes: pequeños tomates dulces, llamados también cherry (cereza) en España. *hybrid: híbrido, creado a partir de plantas distintas. *hand-crafted: realizado a mano, mediante injertos, como en los rosales, limoneros, etc.y no en un laboratorio.